Edgewood Monuments is known in the Puget Sound area as the source for the finest headstones, monuments, memorials and portraits. Our family brought the timeless art of portrait monuments over from Europe when they immigrated to the United States. Upon arriving to Seattle, my father spent his time sharing and displaying his artwork to local cemeteries and fellow monument makers. After meeting a retired veteran in the monument industry who could point him in the right direction, he became well known in the industry for his precision and care when crafting monuments and portraits. We are proud to bring our family tradition of granite craftsmanship and portrait art to honor your family. 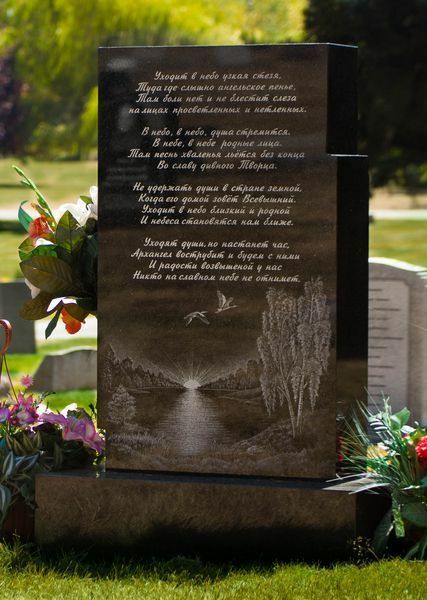 Countless design options, crisp and clear etching and over 60 colors of granite to choose from allows you to design the perfect monument to remember your loved one. We are three generations of craftsmen who’ve continued to expand and pass down our knowledge through our family trade. With our ever-increasing passion for quality craftsmanship we give you stunning, high-definition, lifelike, and durable works that match your needs. We blend dedication, artistry and craftsmanship to offer outstanding products at reasonable rates.